Amy Fleming is a participating artist in the curated portfolio, “Right In Front of Your Eyes” now on display at the Southern Graphics International Print Conference in Portland Oregon. Participants include printmakers from all over the country, who each made an image to call attention to harmful, destructive and unsustainable practices. 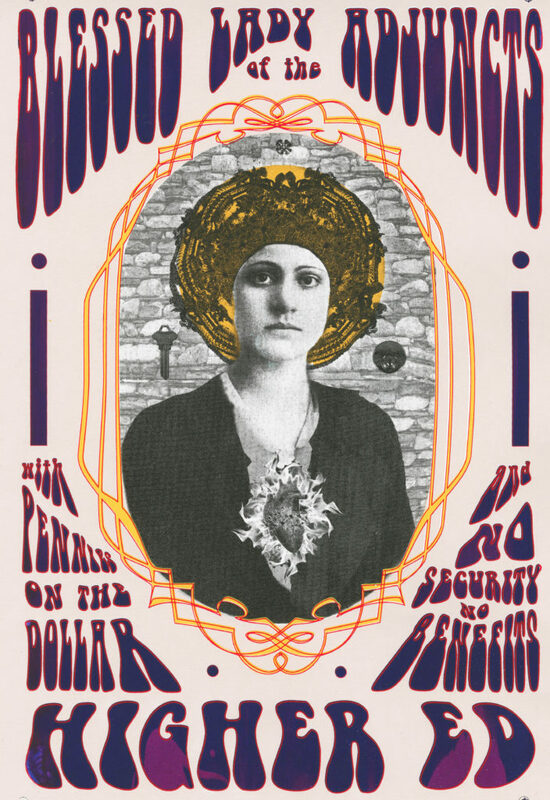 Fleming’s screen print, “Blessed Lady of the Adjuncts”, focuses on unsustainable labor practices in higher education, through combining traditional religious prayer card imagery with a healthy dose of Jefferson Airplane. “Right In Front of Your Eyes” was selected to be in the permanent collection of Southern Graphics International at the Kennesaw Museum of Art, Kennesaw, Georgia.